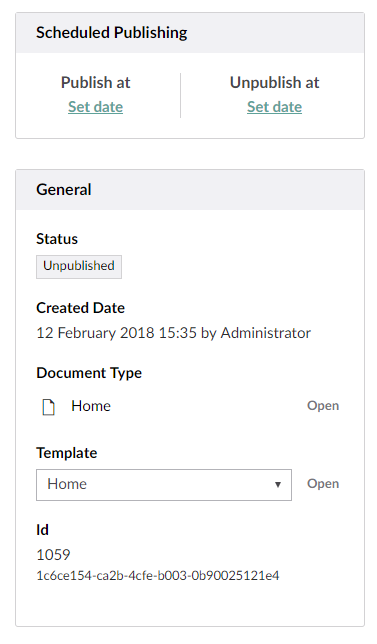 Each document in Umbraco can be scheduled for publishing and unpublishing on a pre-defined date and time. In order to do this, go to the Info tab and find the Scheduled Publishing box in the right side. There you can select the exact date and time to publish and unpublish the current content item. Your server may be in a different timezone then where you are located. As of Umbraco version 7.5, you are able to select a date and time in your local timezone and Umbraco will make sure that the item gets published at the selected time. So if you select 12PM then the item will be published at 12PM in the timezone you are in. This may be 8PM on the server, which is indicated when you select the date and time. If you are in the same timezone as the server, this message will not appear under the date picker. In Umbraco versions lower than 7.5, the time you select has to be the time on the server, these older versions of Umbraco do not detect your local timezone. All users with access to the Content section in the Umbraco backoffice are able to schedule content for publish / unpublish. In some cases you will need to adjust your configuration to ensure that scheduled publishing/unpublishing works. The schedule works by the server sending an HTTP(S) request to itself. To better diagnose the issue you can temporarily change your log4net config settings to be DEBUG instead of INFO. This will give you all sorts of information including being able to see whether or not the scheduled publishing endpoint is being reached or not. In some cases it might be easiest to specify the umbracoSettings:settings/web.routing/@umbracoApplicationUrl setting to ensure that your server is communicating to itself on the correct base url.